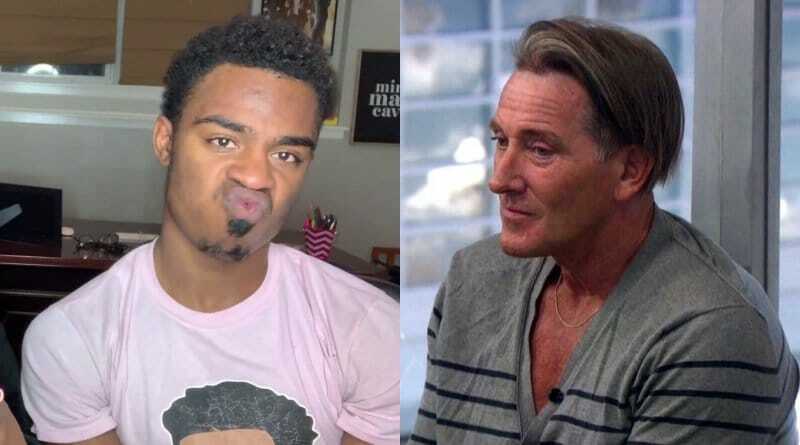 ‘Big Brother’: Swaggy Says Kevin Has No Cancer, So Doesn’t Deserve Fundraiser Money? Big Brother news revealed Chris “Swaggy C” Williams and his BB20 friend Faysal Shafaat (Fessy) raked in thousands of dollars from a fundraiser. Ads listed prostate cancer victim Kevin Schlehuber as the event beneficiary. The event materials said it was to raise money and awareness. Swaggy promised fans that proceeds would go to help Kevin and his family. But in his own words, most of the profit wound up in Swaggy and Fessy’s pockets. Kevin announces his prostate cancer diagnosis last year. After surgery removed the tumor, he is now a cancer survivor. But that requires ongoing medical attention because of the disease. 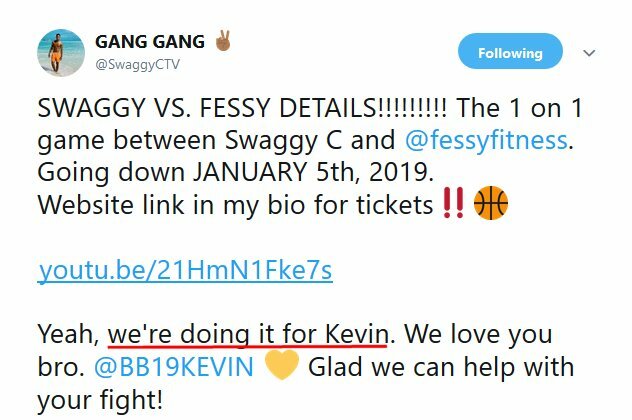 Marketing materials and Swaggy’s own words make clear that Kevin’s name and cancer diagnosis were used to promote the basketball game with Fessy. Swaggy C took to Twitter and YouTube and posted a now-deleted video to tell his side of the story trying to defuse the criticism. Yet, he only seemed to dig himself in deeper as he shared information that seemed to further enrage Kevin’s supporters (and family) even more. In a video posted by Swaggy C, he said the sold-out event brought in $19,100. According to Swaggy, he paid himself and Fessy $2K each from the proceeds as a “talent fee”. He then paid $800 dollars to ZERO – a charity supporting awareness of prostate cancer. In Swaggy C’s deleted YouTube video, he says the basketball event was originally planned as a fan event. He and Fessy would play an exhibition basketball game for Big Brother fans. If that’s all it was, things would have been fine. Former BB houseguests do events all the time to capitalize on their post-reality show fame. It’s common. Fessy was doing interviews with local Orlando Florida media outlets promoting the event as a charity event for Kevin. As seen in his interview with the Orlando Sentinel. But, when Swaggy C heard that Kevin Schlehuber had cancer, he changed the event to be a fundraiser. He specified in the advertising that it was a fundraiser. Swaggy pinned a tweet that said “We’re doing it for Kevin” while asking fans to buy tickets. See the tweet above. 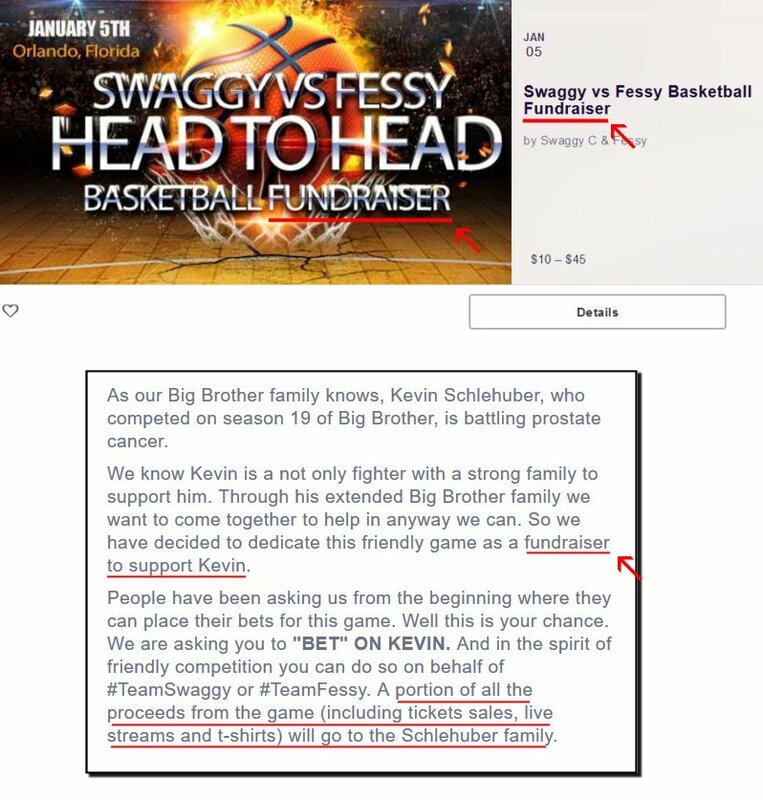 On the Event Brite sales site for the tickets for Swaggy vs Fessy (see below), it mentions that the event is a fundraiser, and even clarifies that it’s “a fundraiser to support Kevin”. It promised that a portion of all the revenue (there were several types) would go towards Kevin’s family. Big Brother‘s Swaggy C also made a YouTube video where he said “We want to raise money for Kevin to help him with his fight. So you guys can help him [Kevin] by coming in person, or even comping a live stream, can help Kevin’s family out a lot”. The implication was, if you buy a ticket or pay for a live stream, you will be helping Kevin. At that point, Swaggy C was selling tickets and raising money as a cancer fundraiser. The event was no longer a simple fan event. Big Brother viewers and fans were buying tickets and merchandise to support Kevin Schlehuber, his family, and cancer charities. After all, it was promoted as a fundraiser. In the video explaining where the money went, former Big Brother player Swaggy C says that a problem arose before the event. He says Kevin became “cancer free”. In the video, he explains that Kevin was going to get “most of it – if not half” of the proceeds. Then, he goes on to say: “Here’s the problem… Kevin became cancer free”. Swaggy C seems to think that Kevin having successful surgery means that all of his cancer problems are gone. Cancer survivors require lifetime screenings and the medical bills for Kevin’s surgery, medication, and follow-up treatment didn’t magically disappear when his tumor was removed. But the most interesting part of the video is when Swaggy describes Kevin’s reported response to getting less money from the cancer fundraiser. There is a jump in the video, which shows part of it was cut out. What part of Kevin’s response was taken out and why? It looks like a live video, but the jump cut shows it was not. Swaggy says that Kevin Schelhuber is “cool with it”. But Kevin later said he’s “extremely hurt” but doesn’t want to argue about it. A cancer patient (whether their tumor was removed or not) doesn’t need that kind of stress in their life. 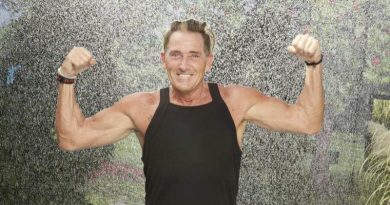 Many fans of Big Brother are outraged that they bought tickets and merchandise for an event billed to help Kevin and prostate cancer patients. Then it came out that the money was going elsewhere based on the excuse that Kevin had successful cancer surgery. Swaggy Vs Fessy Basketball Fundraiser: Where Did the Money Go? Swaggy said they split the profit 60/40 with Kevin Schlehuber, but that just does not add up. He said that “overall the event made $19K,” then he explained how expenses were paid from that amount first. That’s reasonable. He said that left $7,500 profit. From that, he explains that he and Fessy took $4,000 as a “talent fee”, and he gave $800 to the prostate cancer charity ZERO. He also says he gave a children’s charity an undisclosed amount and made a big deal about it on his video. Big Brother followers commented it must not have been that much or he would have mentioned the amount when he was trying to account for the money. He says he gave Kevin $800, not the $500 his daughter claimed. However, other reports indicate that amount didn’t even cover Kevin’s travel cost for the event. It seems that Kevin actually LOST money coming to an event advertised as a fundraiser to benefit him. While Kevin seems to be out some money, Swaggy appears to have profited off the cancer fundraiser. I got 2k for putting the WHOLE event on myself, labor, & playing the game. Fessy got 2k for bringing/drawing most of the crowd (Fessy fans) & playing the game. Zero got 800 for their portion of the proceeds. 60-40. Not speaking on it anymore. That’s it. The Swaggy Vs. Fessy Event – A Disaster From the Start? To be fair, it sure looks like Swaggy C was in way over his head from the start. He may have grossly over-estimated his base of Big Brother followers. In the video, he explains how his job was to line up sponsors and he failed. He got very emotional when he talks about how Bayleigh Dayton had to bail him out and pay for expenses. Swaggy says she took over the planning. In another video, he bragged that she booked them a giant 11 bedroom Airbnb for the event. Was the Orlando mansion one of the expenses paid for out of the fundraiser coffers? He also talks about how he had to refund t-shirt buyers because it was easier than having the shirts made and sent to the fans. Swaggy C is known for his custom tees, so it’s a bit ironic. Swaggy C goes on at length in the video about how he would have given Kevin Schlehuber more money, but for lack of sponsors. Yet, Swaggy got paid. He said the $2,000 he took from the event and $2k he gave Fessy was a “talent fee” for him playing basketball. Kevin Schlehuber is a very nice guy by all reports. Everyone who has met him or watched him on Big Brother can attest to the good guy factor. He is a father to seven kids and has a big heart. The revelation that he was battling cancer caused fans everywhere to voice their support. Since Kevin is so kind, it is not surprising that he held back on speaking out on the charity event drama until now. Via Twitter, Kevin shared that he had tried reaching out to Swaggy, but did not receive a response until his daughter tweeted about it. Then Kevin acknowledged the situation in a way that only he would. He wished Swaggy C well, but said he will not argue about it anymore. He said he is just disappointed how the whole thing went down. One Big Brother participant showed genuine remorse. Fessy Shafaat tweeted an apology for his part in the fundraising fiasco. Fessy said he was invited to show up and play. But he had no part in the logistics, planning, or expenses. Fessy said he came for the fans, to play basketball, and “spread some love” for a good cause for his friend Kevin Schlehuber. Everything else that happened was not in his control. Tweets from Swaggy back this up. He posted on Twitter that the event was all his. Fessy wasn’t part of the planning. 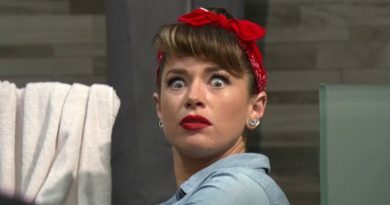 The video ends with other Big Brother houseguest Bayleigh taking over and saying that it is no one’s business where the cash from the fundraiser went. She says clearly: “Don’t count my money”. Again, if this was any other fan event, she would be in the clear. Follow Soap Dirt for the latest Big Brother news! ← ‘Sister Wives’: Kody Brown Begging For New Gig – Bizarre Whole Foods Tweet? ‘Big Brother’ Spoilers: BB20 Sam Bledsoe – Having Mental Breakdown or Genius Gameplay?